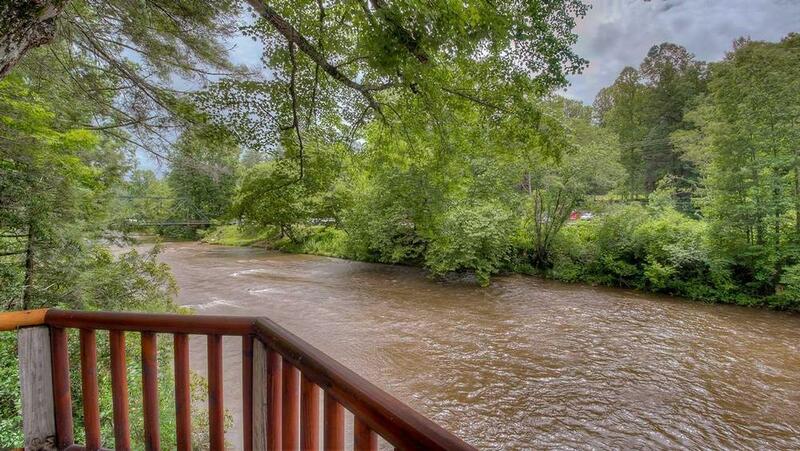 River Run is aptly named— this stunning home is built right on the banks of the Toccoa River near the famed Shallowford Bridge in Blue Ridge. 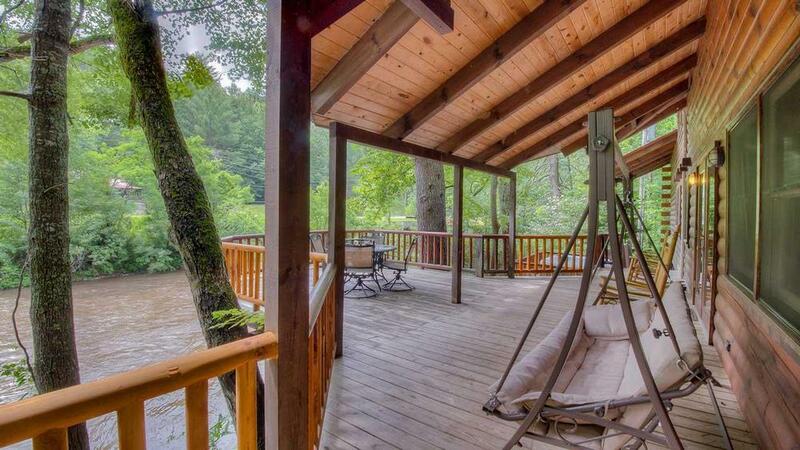 The views from this unique property are as close to the water as you can get, and the home is tucked into the corner of a lovely wooded lot. Here, life is about both the liveliness and calmness of the abundant river. 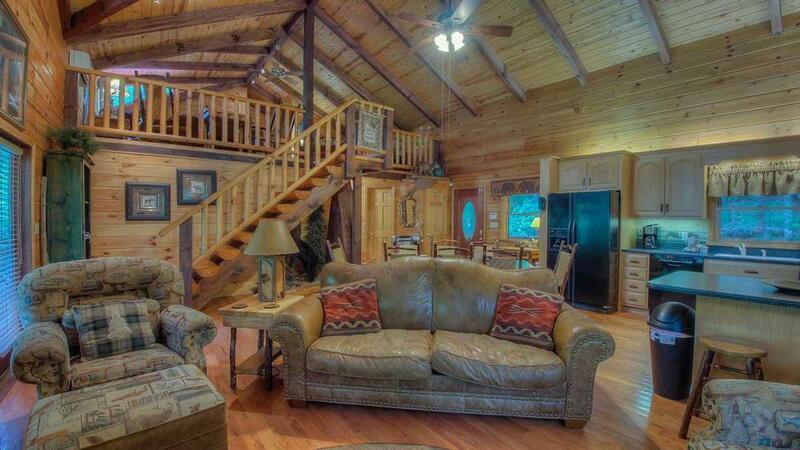 You can cast your line to fish directly from the home's huge deck, without moving from your comfortable rocking chair. Or, grab your inner tube to join the happy passersby on floating rides toward river's end. 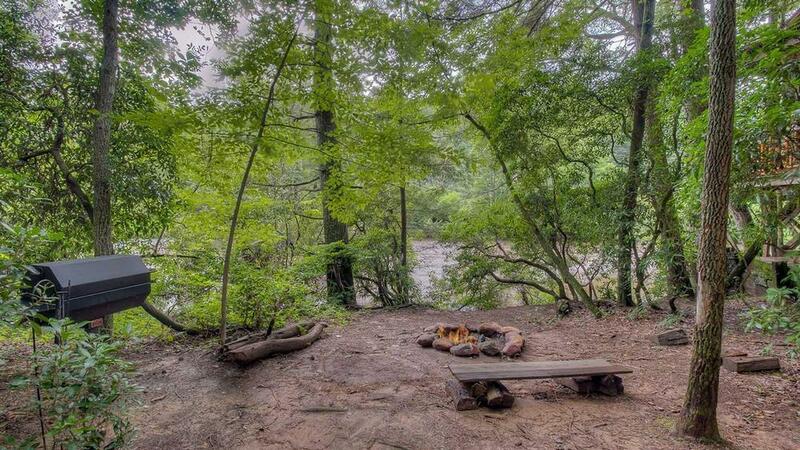 The home's level lot offers many vantage points to take in the plentiful views and activity whether from picnic tables, the charming outdoor swing, the huge hot tub or from around an outdoor horseshoe pit. River Run is an all-wood, interior tongue and groove construction. The completely open floor plan provides great acoustics for rushing water sounds and large windows allow gentle sunlight to reflect back into the home like golden sparkles from atop the river ripples. River Run is cozy with custom furnishings by the prominent Blue Ridge-area interior designer, Charlotte Sisson. You will sink softly in to the great room's over-stuffed seating and rest soundly in the famously plush Stearns & Foster mattresses that grace every room. 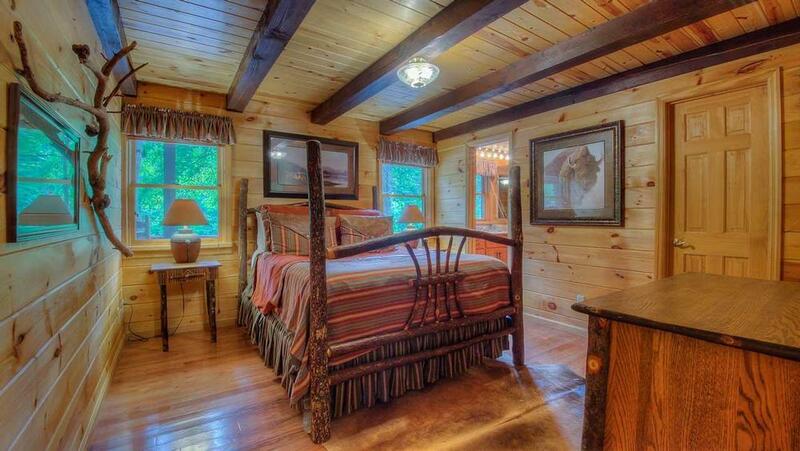 All are framed in masterfully hand-crafted log beds. The home sleeps up to eight comfortably with three bedrooms offering three handcrafted log beds and a queen in the loft area which also has its own additional sitting area. River Run's decor is fanciful, focusing on all of the area's creatures, great and small, and reflects the life within this river and mountain region. Of course, the luxury dwelling is complete with high-end flat screen televisions and a chess table for entertainment as well as high-end appliances throughout. Let River Run take you away where rushing rapids, river rocks and swaying trees provide a spa-like setting — as only nature can provide. 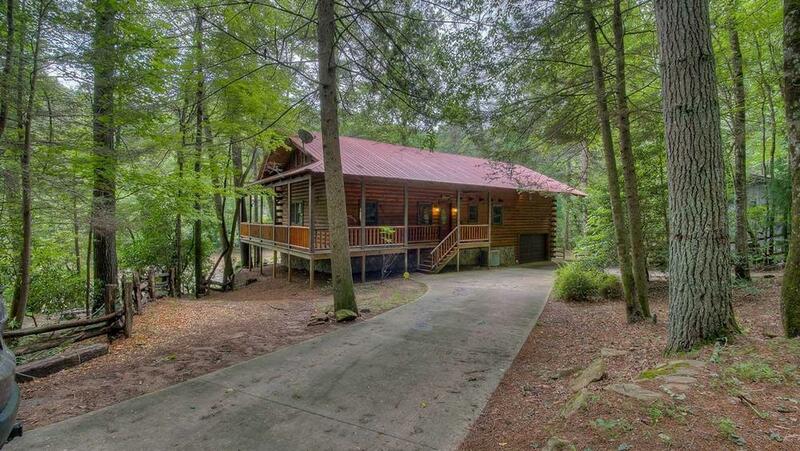 Walking distance to Chattahoochee National Forest, Benton MacKaye Trails, rafting companies and old country store. 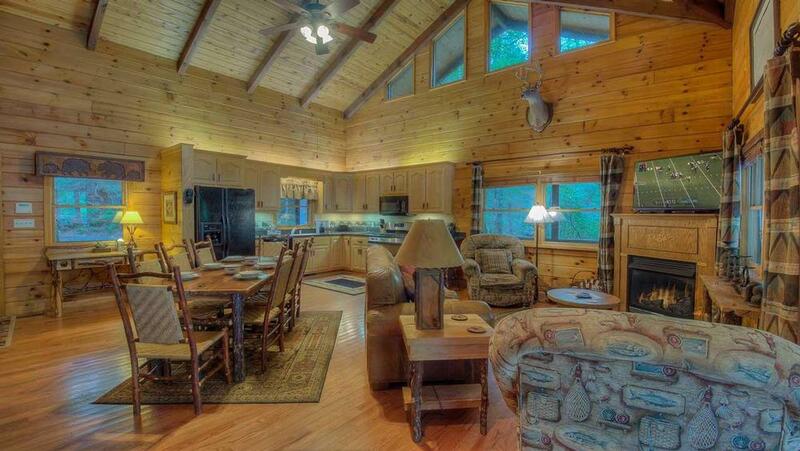 11/18 - This cabin was THE cleanest and nicest vacation rental we’ve ever rented! It was a perfect set up for my husband and our daughter’s family. We will rent again! When we called about the internet modem not working, the rep was on the problem immediately! 09/18 - Liked the proximity to the Toccoa River. 09/17- We loved the easy and beautiful walk from the cabin to the General Store & Cafe for breakfast! I felt the cabin was pretty clean, as I have high expectations! Very quick responses! Our power went out from the storm and they called me back several times with updates! 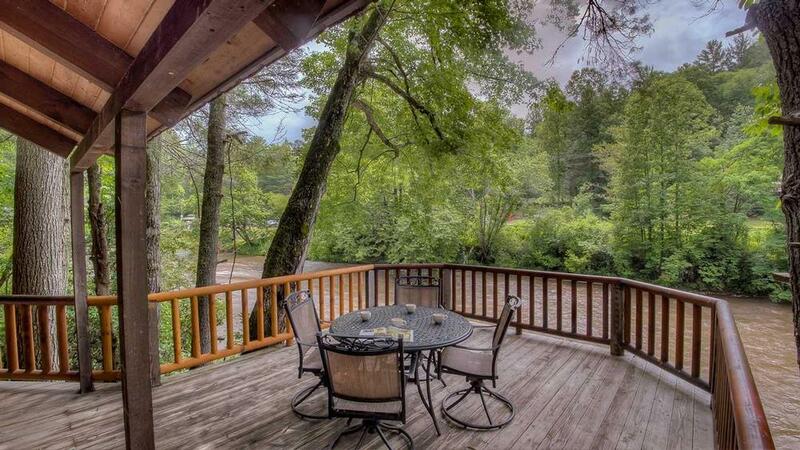 09/17- Enjoyed the sound of the Toccoa River next to the cabin. Nicely decorated, very beautiful cabin, we enjoyed having mom's birthday there, enjoyed the horseshoes...the deck by the river is a perfect place to relax and socialize w/family. Have used Escape to Blue Ridge several times, they cover all the bases on furnishing not only a nice cabin but the little extras like dishes, clean towels, games,etc...I will be back! 09/17- Love that the cabin is easy to get to and right on the river. Also love how conveniently located it is to the nearby hiking trails. 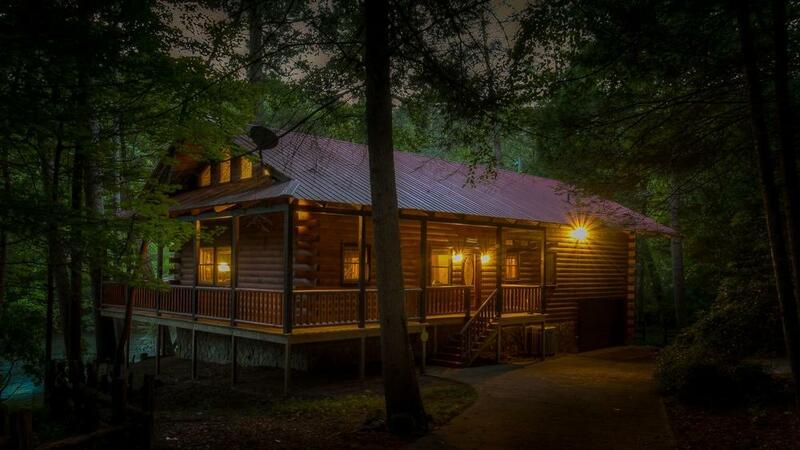 Have stayed in 2 different cabins now and both times were a great experience. Will definitely book again. 09/17- The cabin was spacious. Being on the river was what we wanted. The kitchen was nice. 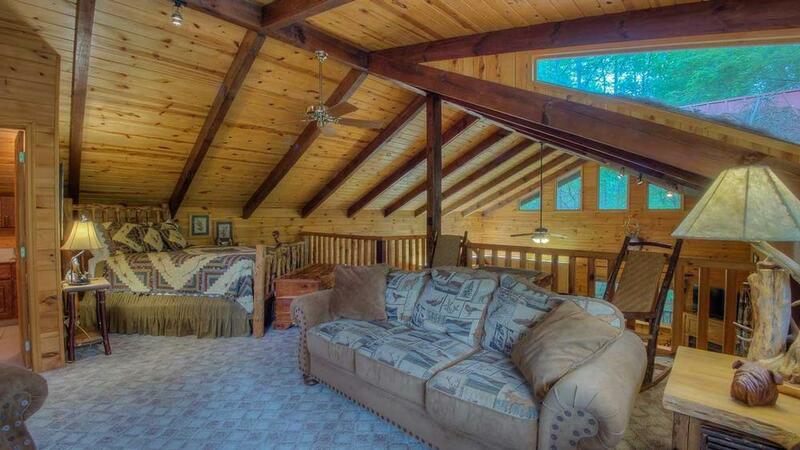 We've rented from Escape to Blue Ridge several times. Our impression is good. 06/17- Enjoyed being on the river. Wonderful atmosphere with the furniture. 03/17- We loved the river front location. The reservation process is very easy and the staff is always friendly. 01/17- Lovely view of the river. Everyone was terrific and most helpful and friendly. 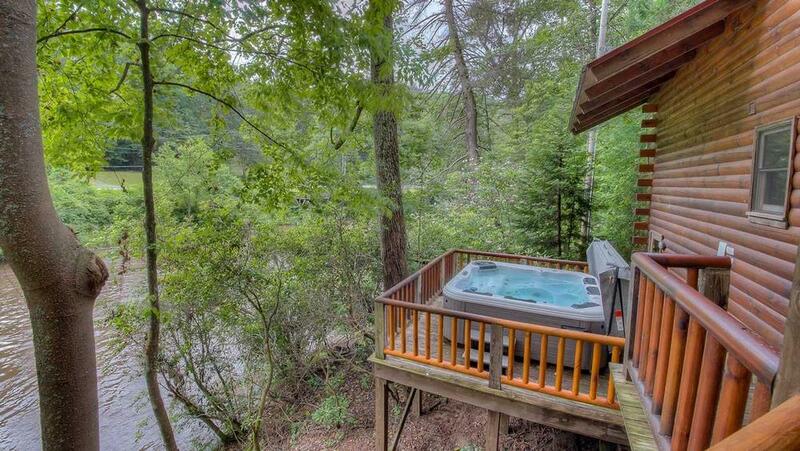 12/16- I enjoyed the hot tub, the river right outside the cabin and the peace and quiet. I like how the directions explain everything you need to know about what to expect. Everything was just like it was on the website but even better and everything was so clean. I would recommend it to friends and family. 11/16- The location in fall was beautiful with the river and fall foliage. 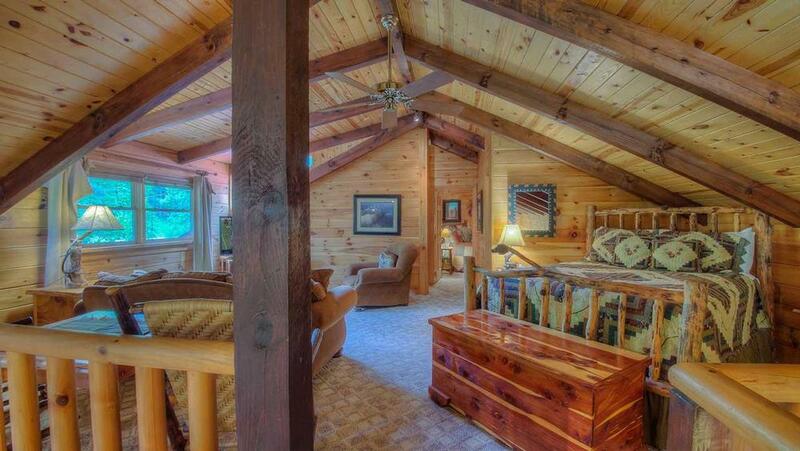 The decor was and furniture made the mountain retreat complete. Waking up with the sounds of the river was so tranquil. The staff were very kind, professional, and courteous. 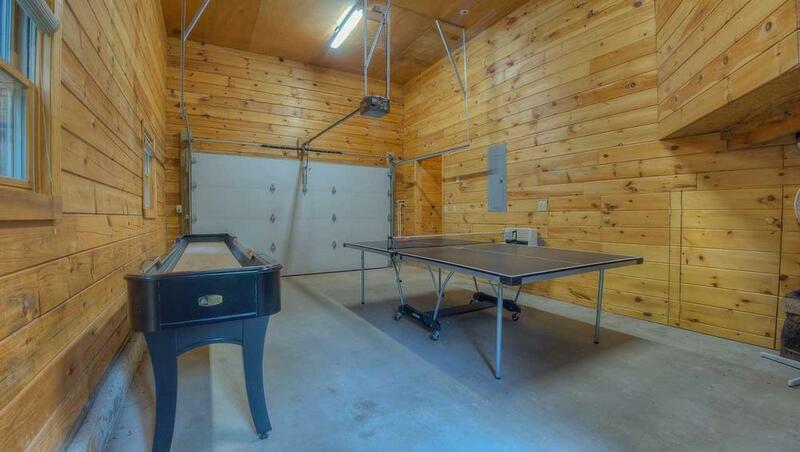 10/16- Great location including not too far from town. 08/16- Location, ease to get to especially in snow, and fact that it's pet friendly. Have stayed there 3 times now and will stay again this winter. Great company helpful friendly and very easy to deal with. Never have had a problem in the 3-5 times using it. Will continue to do so and recommend it to friends. 07/16- Loved how we were right on the river! We also loved how open everything felt. 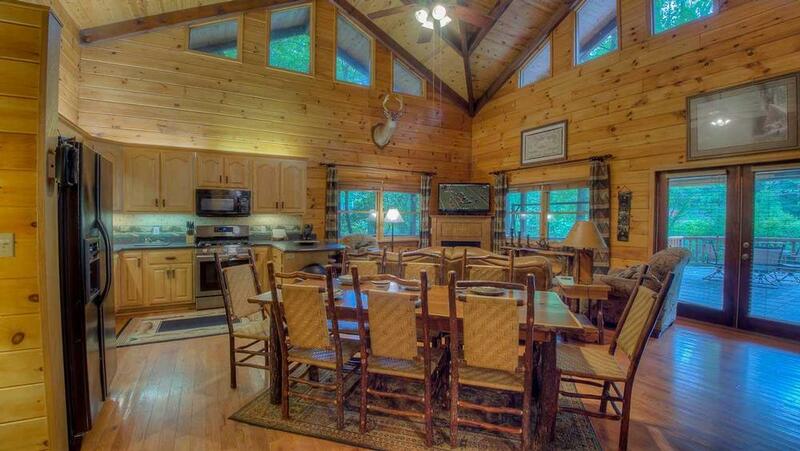 It truly is a beautiful cabin! We love using you guys and will most definitely use you guys in the future!! 06/16- LOVED the deck that jetted out over the Taccoa River. Kids also loved the ping pong table! I loved the hot tub. Great location. 06/16- Everyone in the party was thrilled with the deck situated directly on the river. The outside was clean and accessible to walking to the river. Fishing by the cabin was great for those who waded into the river - fishermen caught beautiful rainbow trout!! The kitchen and bathrooms were clean and plenty of towels, etc. were supplied. 04/16- The location was amazing, near a lot of great hiking, perfect for day trips. The home itself being located right on the river could not have been more inviting for nature lovers. 11/15- Foremost the river as the sound and view was so relaxing. The beds were well appointed. 11/15- Being on the water was nice. 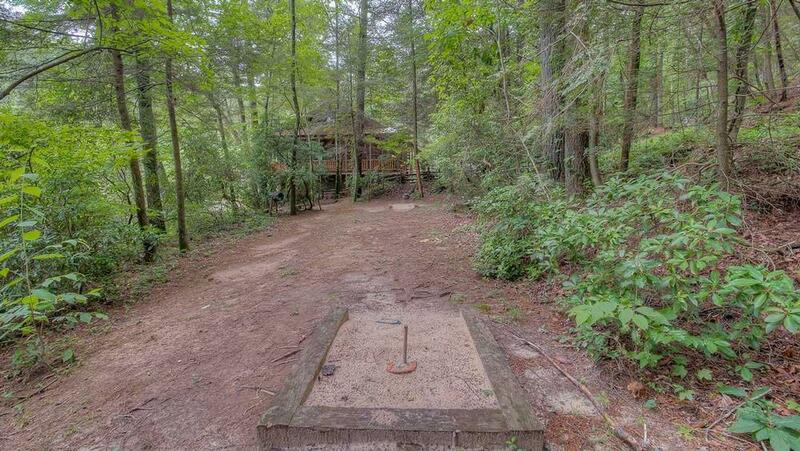 09/15- The property was in excellent shape! We very much enjoyed the view and sounds of the river which was right outside our door. This property exceeded our expectations. The Escape to Blue Ridge team was easy to work with and provided timely and accurate information. 08/15- This was our third time at River Run. 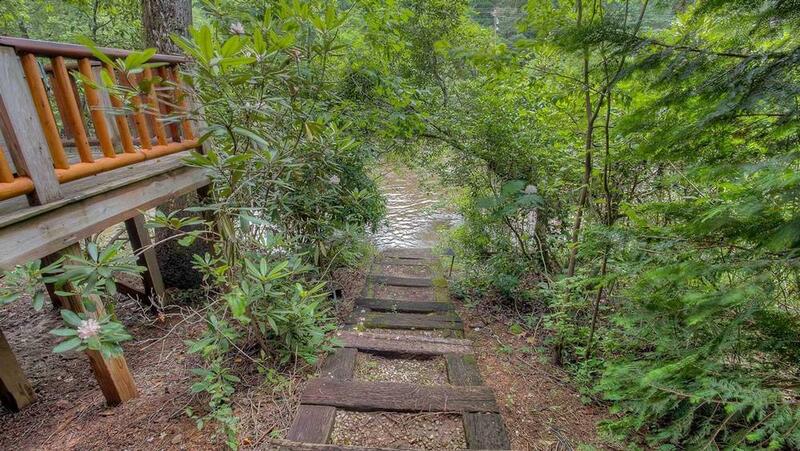 It's trainquil setting right on the tubing River and quaintness of the cabin make it a perfect get away for our family! The staff is helpful, courteous, and efficient. 07/15- The cabin was comfortable and in a good location for access to all the surrounding outdoor activities. 06/15- Amazing view! Great location! 05/15- The location was exactly what we were looking for. 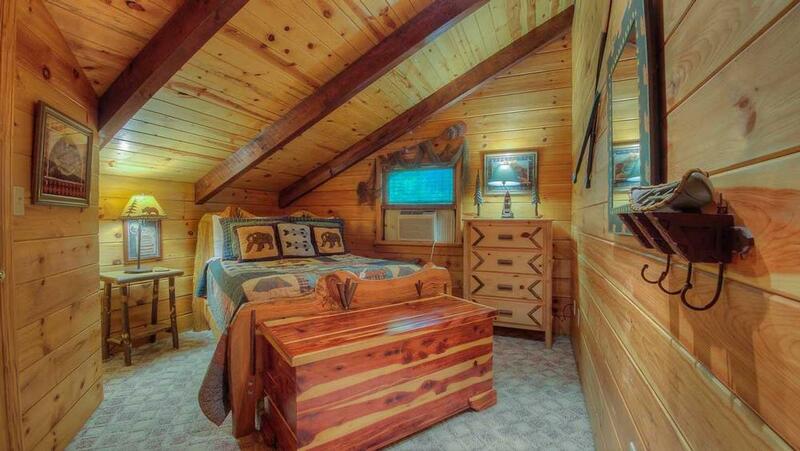 There is nothing exemplary that stands out about this cabin. 04/15- We enjoyed the location on the river and having a space for our family to get together. 01/15- Spacious, very comfortable, easily accessible and right on the river. 11/14- Fireplace, being on the river were among the favorite features.We loved it!!! It was so relaxing. The leaves were so beautiful. Everyone we met were lovely. 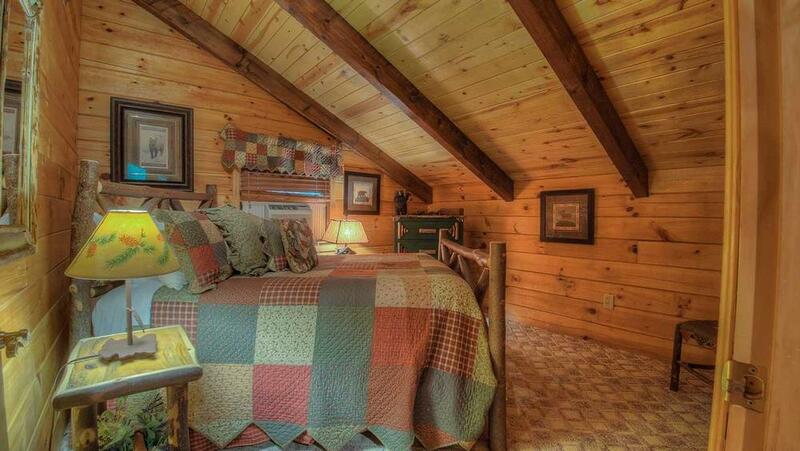 We loved the cabin, it was very clean and comfortable. We enjoyed the train ride and found several really good restaurants. We plan to return soon. 08/14- The river is awesome! We had a wonderful time. 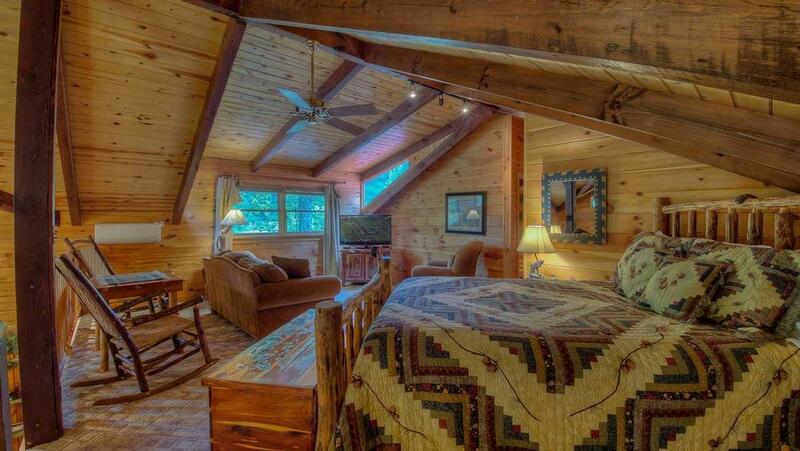 The cabin is comfortable and well appointed. Lots of fun for ages 2-70. Thanks so much.